This is the second book in the Mitch Rapp series. I recently read the first one, American Assassin: A Thriller (Mitch Rapp Book 1) , and was excited to get to the second one. I have to say I wasn't disappointed! I recommend this one to anyone who might like to follow a spy/assassin around without actual bullets flying past them. Now I'm ready to start in on #3 of the series, Transfer of Power (Mitch Rapp Book 3) . I make this pasta salad a lot in the summer time because the produce is fresh and we eat a lot of meals in which a pasta salad goes great with them. My cousin turned me onto the Suddenly Salad and the bacon ranch one in particular. We fell in love. However, I just had to add stuff to it. I once added tomatoes from my garden. It was heaven for the first couple of bites, but then it became a bit watery and pink. My solution - don't add too much tomato. At least my girls loved the pink color of the salad. Then, one day I didn't have my trusty box of Suddenly Salad but I really wanted some, so I made my own from scratch. I'm not a fan of the bottled ranch you buy on the shelves so I have a big bottle of dry Hidden Valley Ranch mix in my cupboard. I prefer that to the pre-made ranch and we use the dry mix for stuff other than just salad dressing. But, if you like the bottled ranch, by all means, use it. It makes the recipe that much easier. Though mixing up your own ranch is pretty simple. I really like this recipe because it's so very versatile. When making this I rarely measure anything, so I won't be giving you exact amounts either. Give in to your imagination. This one is pretty hard to mess up. Cook your pasta to your tastes. I like mine softish, but not mushy. The amount depends on how much salad you want in the end. Drain and cool while you prepare the rest of the ingredients. While my pasta is cooking I make my ranch dressing and add the bacon bits. When your pasta is cooled and drained all you need to do is add it and your veggies and/or meat to the ranch dressing. Coat everything well with the ranch and it's done. So easy and very tasty. It has been a long time since I did a post with a new recipe. I'm excited to share this one with you guys. I saw some yummy looking tomatoes on my news feed over on Facebook and thought that would be something I'd like to try. I checked it out and read the recipe. Then I forgot about it for a couple days. Of course, I have no idea who posted it and there's no way I'm going to find it again. So I looked up baked tomatoes on Google. I never did find the recipe I saw on Facebook but I did find several others. Some called for balsamic vinegar and some for olive oil. I've never done anything with balsamic vinegar so I decided I'd try it out. I didn't follow any specific recipe and just threw these tomatoes together with what I remembered from the various recipes. The first picture is of the tomatoes before I put them in the oven. The second picture is of the finished tomatoes. The third picture is of the meal we had the tomatoes with. Sliced Tomatoes - I wouldn't recommend slicing them too thin. I think 1/4 inch or thicker would be best for this recipe but I think you could simply cut a tomato in half for this recipe if you wanted to. I used Roma tomatoes because they were the cheapest at the grocery store. Minced garlic - I have a big container of minced garlic in my fridge. I use it for a lot of things. I'm certain you can use fresh garlic and mince it yourself. The flavor might be better, but I'm lazy so I really like my big container of minced garlic. Shredded cheese - I think you could use any kind of cheese depending on your taste. Most of the recipes I read called for parmesan. I chose a mix of shredded cheeses. It was called Italian six cheese blend. It had mozzarella, provolone, asiago, parmesan, fontina and romano cheese. Bread crumbs - I bought a container of bread crumbs, but you can make your own and use those. They are good for a lot of different things. Salt & Pepper - You could use your favorite seasoning salt instead of just salt and pepper. This is how I made mine, but I think part of the joy of cooking is figuring things out for yourself and just winging it. It's really fun when you wing it and it still tastes good. Don't be afraid to do things your own way. Put the tomato slices on a cookie sheet lined with tin foil. Drizzle balsamic vinegar over the tomatoes. (The next time I make these I'm going to try olive oil in place of the vinegar just to see what kind of difference it makes.) I put a small amount of minced garlic on each slice and then sprinkled a small amount of bread crumbs over them along with the salt and pepper. Then I put the shredded cheese on top of each slice and then another thin layer of bread crumbs because I couldn't remember if the crumbs went on top or not. I put the pan of slices in the oven set on 400 degrees and baked them for about fifteen minutes. Keep a good eye on your tomatoes after you hit the ten minute mark - all ovens cook a bit differently. Then I put the stove on broil for about a minute and a half to brown the tops. Always keep a good eye on things in the oven when on broil. I rarely make a batch of garlic toast under the broiler that isn't burned. It could be just me... I freely admit I'm still learning to cook. Dorothy Rosby is a syndicated humor columnist whose work appears in newspapers in eleven Western and Midwestern states, as well as in local and national magazines. Her column has been recognized by the South Dakota Newspaper Association, the South Dakota Federation of Press Women, and the National Federation of Press Women. Let me start off this post with a disclaimer. I personally know Dorothy Rosby. She's a member of a couple of writing groups I'm also a member of. She is a really neat lady. Now that you know that you can choose to believe the raving I'm about to do is because I know her, but I will tell you with the utmost sincerity that is not so. Dorothy Rosby is an amazing author who speaks my language. I haven't finished the book yet at the time of scheduling this post, but I am enjoying every single word I've read so far. This book has lifted my spirits over and over the past few weeks. I'm taking my time with this one because it is several stand-alone articles and I can stop easily anywhere throughout the book and I won't lose my momentum for the story. Plus, it's definitely one I don't want to end just yet. I'm savoring it and not rushing through. It's the perfect book for any moment. If you want to sit down and read it from cover to cover it flows quickly and easily. If you're like me, you might just want it to last a little longer and read it in between other books so you can make the journey last a little bit longer. Dorothy Rosby is a syndicated humor columnist and is published in several different magazines as well as newspapers. Unfortunately, I don't know which media outlets carry her column. Before reading this book I'd only been privileged to hear her read her own work. Let me tell you, I was impressed before starting to read her book (a compilation of her columns), but as I read I become more and more impressed with her talent and even more so with her as a person. I Used to Think I Was Not That Bad and Then I Got to Know Me Better is just plain perfect. You should be able to tell that from the title alone - I love the title! I would definitely recommend this one to anyone. In fact, I've been reading it out loud to my husband and children (ages 14, 7 and 5). My fourteen-year-old asked me the other day, after I expressed some displeasure with her father, if I wanted a duplex - a joke Dorothy makes about married couples. This book has made an impression on all of us and we aren't even finished with the book. If you enjoy humor at all, this book is a great addition to your library! 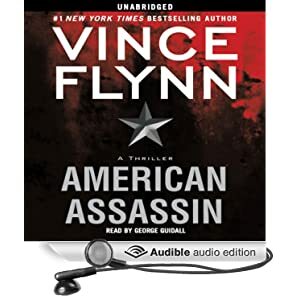 #1 New York Times bestselling author Vince Flynn introduces the young Mitch Rapp on his first assignment, a mission of vengeance that made him a CIA superagent. I will provide links to the book for any of you who might be interested, but I actually listened to the audio version available from Amazon/Audible. Most of my reading is done via audio books so I can do other things while "reading". For example, during the narrative of this book I picked up and dropped off my kids at school for a week as well as doing some housework and crochet. Vince Flynn has been recommended to me several times but, until now, I hadn't gotten around to his books. I have to say, I was not disappointed with American Assassin. American Assassin is the first book in the Mitch Rapp series and was released in 2010. Yes, I'm slow at getting to most books. I rarely read what's being read by everyone at the moment. I've not done a lot of research on Vince Flynn and don't know if he's written any other series or stand-alones. I was mostly interested in this series because it was recommended to me and it's about an assassin - go figure. American Assassin is mostly about the recruiting and training of Mitch Rapp with a mission or two thrown in. The book was very well written and kept me interested all the way through. It's the kind of book I'd like to write, someday. If only I could be more serious for longer periods of time. I'm really excited to get into the next book - Kill Shot. I have no idea when I'll finally get to it though. I don't normally like to read while I write (I'm currently working on book #6). But, I've given myself a goal for reading that I'd like to keep up on. We shall see if I can manage it. I would recommend this book for a great escape into a realistic world of spies and assassins. Now drop and give me fifty! 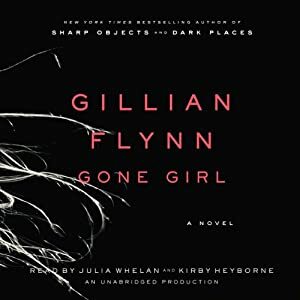 I decided to pick up Gone Girl for a couple of reasons. Two - the reviews of the book are very intense. Some say it's horrid, some say it's great. Most say they hated the ending. I HAD to know. I assumed, because of the reviews, I probably wouldn't like the book. I'm glad I tried it anyway. I really liked the book. It wasn't fun or happy, but it was very interesting and kept me wondering. It's a bit deranged and without giving out spoilers, I can say it's an interesting romp through crazy. The book isn't overly gory or vulgar, but it definitely is an adult read. It takes us through a fairly typical, if slightly unhappy, marriage. Though I have (or seem to have) a great relationship with my husband, I can see how the marriage between Nick and Amazing Amy evolved into what it did. As for the ending - you'll have to read the book or watch the movie to find out the ending. I'll just say that though most of the reviews I read said they hated the ending, I think it was appropriate to the story. Even if it was... let's just say - the way it is.